Recently I had one of those “what the what am I doing to myself?” moments in my “beauty” regimen. It starts with the sad fact that I hate my skin. It is a problem well-known enough that my little sister picks on me about it. There is nothing quite as embarrassing as being bullied by an 8 year-old. I have tried many, many products over the past few years to get at peace with it. Joyfully, things are actually starting to turn around, I suspect largely due to the fact that I’m just sticking with the same routine for a while. Nonetheless, the Sephora samples were calling my name and I tried this Brazilian peel treatment. Now, “Brazilian” in the context of beauty should probably strike fear into the hearts of all. It burned. But, determined to be pretty, I left it on. (arg!) As I sat there, face burning, gritting my teeth and thinking “beauty is pain,” I grew increasingly angry at myself. Once I rinsed my face (ahhh), I got to thinking about the skin of the women on some TV ads I’ve seen recently. 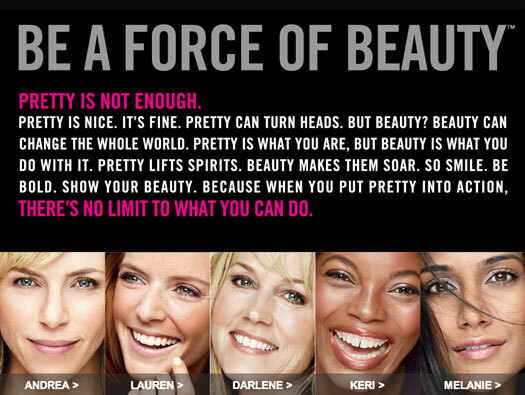 Okay, so actually I really like the premise of the “Be a force of beauty” campaign because it puts the emphasis on action rather than passively being pretty. That’s kind of great.I like that the models have wrinkles and spots and other “flaws” and are still beautiful. It is kind to my own vanity. And I like the idea of blind casting. But I don’t buy it. (Full disclosure: Actually, I have been using this brand’s foundation for years.) All of the women chosen are stunning. Maybe it’s makeup or airbrush or whatever. But the company readily states in one of the spots that they started casting by sending out a survey to models and actresses. Models. And actresses. (models and actresses!?) Do you see where I’m headed…The whole darn thing is internally contradictory. Now, let’s imagine that they had done what would have been more “authentic” and way cooler: a truly open casting. I suspect that they still would have only gotten women who looked like models. Because we are thoroughly conditioned to know who looks model-y and who does not (Thanks, Tyra). I’m willing to bet that at least 90% of the women who would have applied would have been beautiful, not by kind real-life standards, but by industry standards. And I kind don’t understand how the people who concocted this idea didn’t anticipate that. They would have gotten the better story and still gotten the pretty. “This campaign is really designed to inspire and activate women to put beauty into action by giving them a voice and championing the individual stories that represent their own ‘force of beauty,’ said Simon Cowell, Global CMO for Bare Escentuals. “Therefore, our approach in identifying these women became profoundly important, and it required a level of authenticity to defend our driving belief that beauty goes beyond the surface.” (Source) I’m not sure how profound it is to cast a model without seeing her if she’s already a working model. So, yes, it’s cool and I like what they’re saying, but it’s still an ad and it is still a gimmick. Notice that we only see the women they chose? And if you’re watching TV and don’t know the full story, as I suspect the majority of casual viewers wouldn’t, then you’d have no reason not to think these women were ordinary models. Because they are. When I first saw Melanie and Lauren’s ads. That’s exactly what I thought. I’m really torn because I like the message but at the end of the day it doesn’t seem all that real and the bottom line is that this company is trying to earn your business. Is this a step in a great direction? Sure. Do I love that their products are paraben, sulfate, etc., and cruelty-free? You bet. As the ad suggests, pretty may be skin deep, but the issues that surround cultural ideals of beauty and the multi-billion dollar beauty industry’s stronghold go much, much deeper. If BE wants to make this Force of Beauty thing stick, it’s going to take a lot more work. And they can’t do it alone. But they’re trying to, and trying to do so globally. Whoa. “Celebrating women isn’t new for us; it’s who we are and what we do. It’s always been more than a philosophy, it’s really our DNA,” explains Leslie Blodgett, Executive Chairman of Bare Escentuals. “We have a responsibility to not just tell a singular story of beauty, but rather share in the collective spirit of women around the globe.” (Source). I just keep coming back to how conflicted I feel. What do you think?